Join us for Triton Networkingon the third Wednesday in June in Fort Lauderdale with United Yacht Transport. All captains, crew and industry professionals are welcome to join us from 6-8 p.m. on June 21 — the first day of summer — to catch up with friends and make some new ones. Until then, learn a little more about UYT from its VP Vadim Yegudkin. Tell us about United Yacht Transport. What do you do? United Yacht Transport started in 2012 and has a combined 30 years of yacht transport experience. Paul Haber is president and I am vice president. We specialize in North America and Mediterranean. Our routes touch Fort Lauderdale, Panama, Costa Rica, Mexico, British Columbia, Singapore, Hong Kong, St. Thomas (USVI), Spain, Italy and Greece, however there are more, based on demand. Some transport companies charter ships, others have their own ships. How does UYT work? We charter full ships. This method allows for much more frequent sailing as we are not limited to any number of ships or crane size. The ability to charter any ship anywhere in the world gives our customers a much more reliable and regular sailing schedule. There are several companies that provide this sort of service. What makes you different? United is a carrier with its own cradling equipment and lifting gear, and the highest safety rating in the industry. Our loadmasters are the top in the world. We also provide the best insurance policy in the business. You had an interesting loading last month in Fort Lauderdale. Tell us about it. We loaded several large yachts on the M/V Industrial Guide, including the loading of the 151-foot Leopard under deck. This is an example of our ability to charter full ships. This is important, because this means that the only cargo on the ship is yachts. It also gives us full control of the ship and stow plan. Our operations team is then able to fill the belly of the ship with yachts as tall as 40 feet and put taller yachts and sailboats on deck. Bigger loads means lower costs, and we always pass along these savings to the customers. Economy of scales. The biggest yacht we loaded on the Industrial Guide was the 174-foot, 650-ton expedition yacht M/Y Ulucitcan. 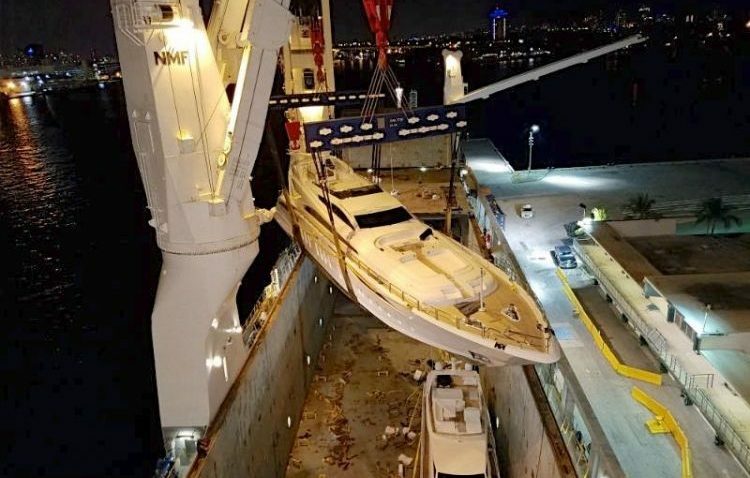 This was verified as the heaviest yacht to be lifted by any company in over five years. Great job by our top notch loading team. All in all, the Industrial Guide will take over $250 million and 4,000 square meters of yachts to the Med. What advice do you give captains and crew before they deliver their yacht to UYT? Follow our preparation guide, which is available on our new website launching this month, and check your emails every day for the latest updates on loading and discharge times. Are delivery schedules established or do they fluctuate from year to year? This is a good question. There are sailings based on season, boat shows and some that are based on demand. For example, there are always sailings from the Med and West Coast in time for the Fort Lauderdale boat show the fall. There are always seasonal sailings to the Pacific Northwest and Mediterranean in March, April and May, and return voyages in September, October and November. I always suggest to the captain or whomever deals with the transport (sometimes the chief engineer) to call me in advance and secure the space as soon as the owners have made their decision. Triton Networking always brings the best crowds, and we are looking forward to seeing all our friends and meeting new people. We will gather at The Triton office at 1043 SE 17th St. (33316). For more information about United Yacht Transport, visit united-yacht.com, contact the company at +1 954-383-4448 or sales@united-yacht.com, stop by the office at 2830 Marina Mile Blvd., Suite 118, in Fort Lauderdale (33312), or join us at Triton Networking on the third Wednesday in June from 6-8 p.m. for casual and professional networking.